Covenant Relationships: How to Treat a Woman You Love: Men Pay Attention!!! 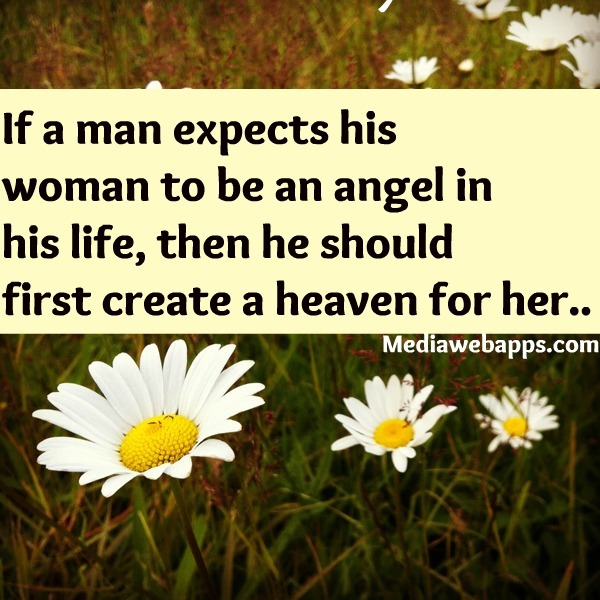 How to Treat a Woman You Love: Men Pay Attention!!! We all know her, we all need her, and men particularly, need to realize the things that they should do to make all the important women that they cherish and love to feel happy and cared for! First off, treat her as if she were something precious that you want to be together forever with. Secondly, treat her like how you would want a man to treat your sister,your mother,your girl friends. Would you want someone else to treat the women you care about in non positive, non caring, and non loving ways? Of course not! So in other words, treat her as how you would want all the other women in your life to be treated; with love, respect, and protection. Third, treat her as a person, not an object. This means really treating her like a princess, by caring for her needs,her wants and always paying attention to her emotions and taking the time to ask questions and to talk to her. Also try and to give her comments that make her feel good rather than put her down; positives over negatives! Fourth, take the time listen to her opinions or ideas. Appreciate her as she is and never underestimate her intelligence.Listen to her and respond in a non-condescending manner, even if you don't want to follow her advice or opinions. Show her that you appreciate her input and by doing so you are treating her as an equal. Be there for her if she’s crying or is she is upset by holding her. Find ways to compliment her…if you think she is beautiful say it! “Beautiful” is so much more respectful than “hot”. Love and learn to appreciate her for who she is, as well as her body type. Don’t try and change her physically, just love her natural beauty. If you didn't love her for who she is inside and out, then you wouldn't have been with her in the first place. Don't ever, and I mean ever date a woman with an ideal of a what you think a perfect woman is and try to change her to fit that ideal. It is not fair to her or to you to expect something like her changing herself and her essential being to fit who you want her to be. Love her for who she is! Hold hands with her on the street…don’t be ashamed to be romantic, that is how women know and feel that you care. A dozen red roses every time you go out is too much and at times too fake, but a single rose with a handmade card tied with a ribbon, now that is sweet,simple, and a true way to show you care. Also men, when you meet up with your friends, introduce her. Don't forget that she may be shy or may not know all of your friends. Take the time and effort to include her into your group of friends if possible. It shows that you care and want her to be a part of your life. Be a gentleman! Look out for her feelings, accept her values/morals, be interested in her life, ask her what’s going on, be helpful, never put her down, if she’s wrong don’t go out of your way to prove her. Be nice and treat her like she is special. Don’t push her to do things she is not ready for. Treat her with respect and pay attention to the small things. Don’t put her down, or make her feel uncomfortable when you are hanging out together with your friends or your parents, Stand up for her, if one of your friends puts her down, confront them and tell them that it is not okay. Most importantly never cheat on her, harmfully lie to her. If something is wrong with the relationship, sit down and have a conversation and try to resolve the conflict. At the end of the day every little thing you do, and every effort you make to show the women you love that you love her will be noticed, and it will make your relationship stay together. Good Luck and get out there and show her that you love her!